The first installment in the epic Utawarerumono SRPG/VN saga, Mask of Deception, is launching on May 23, so it’s good timing that Atlus announced release details for the second part, Mask of Truth. After all, nothing is more vexing than having plot lines dangling in thin air! We reported on the two Utawarerumono titles back in January and now we know that the conclusion to the story of Haku, Kuon et al. will launch on September 5 for PlayStation 4 and PS Vita. The publishing details vary slightly between Europe and the Americas. European players get access to a physical edition for the PS4, but only digitally for the PS Vita. American players get both digital and physical editions, and additionally there will be a limited launch edition and a pre-order special bonus. Oh dear. Oh Atlus. They dropped a spoiler in the advert for the American pre-order details. The bonus items refer to two mysterious (mysterious for a reason - you find out their identity only as you play through the first game!) characters, whom I shall refrain from outing. I hope we find out in the sequel how and why Haku ended up, devoid of memories, in the Yamato empire. But first there is a civil war brewing and injustice and oppression to be stood up against. It appears this second part is longer than the first, and features basically more of everything. 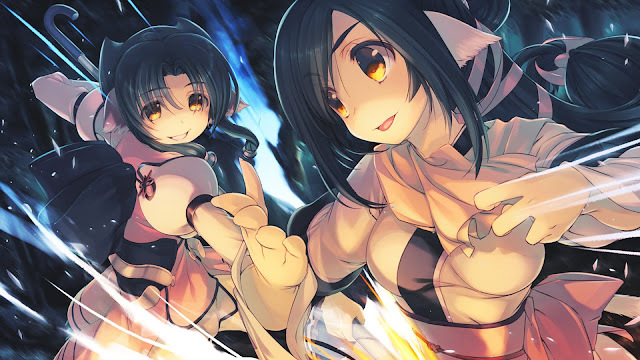 Utawarerumono is primarily a visual novel, which makes the battle events that punctuate the story a real focus. So it is welcome that those mechanics have been updated, keeping the pace flowing. There will be new action chains (skills and bonus moves), a higher level cap, and co-op chain attacks between certain team members. To practise your tactics, a new Mock Battle mode, offering extra points, is available; how that differs from the Free Battle mode in the first game we’ll have to wait and see. It was December 2015 that I promised YummyYummyTummy's action RPG Fallen Legion within six months. As it happens, the game ended up delayed — but will see the light on a confirmed date! Fallen Legion will actually be released as two games on two systems, linked to each other through the effects of a devastating war. Fallen Legion: Sins of an Empire will be on PlayStation 4, while Fallen Legion: Flames of Rebellion will be on PlayStation Vita. Both titles take place in Fenumia, an empire that is part of a war-torn continent. The PS4 title, Sins of an Empire, will have the player leading Princess Cecille on the journey to restore her family's empire. The PS Vita title, Flames of Rebellion, tells the story from the opposite side as the player leads the princess' rival (Legatus Laendur) as he tries to overthrow the royal family. Fallen Legion has some serious talent behind it. Highlights include writer Ben Bateman (best known for being Zero Escape: Virtue's Last Reward's editor) and voice actors Xanthe Huynh (she worked on Persona 5) as Cecille, Darrel Delfin as Laendur, Kira Buckland, Jalen Cassell, Alan Lee, and Dorah Fine. I have real difficulty finding mobile games that fill that niche for quick but comprehensive immersion, for that train or bus ride, or while my dog is brushing his teeth. The last time I struck gold was with Warlock’s Tower, reviewed by Clark, but I had to concede defeat halfway up the tower. I’m hoping for a gentler time with PiPi on her journey to super-charge her painter’s brush with inspiration, in Color Palette: Dreamers for iOS and Android. We’re only getting the first chapter in the West, but with luck and enough colour addicts, we might get more. We can all do with more colour in our lives! Color Palette is a puzzle game. You need to discover colours and drag them onto matching light bulbs; the fewer moves, the higher the achievement, with three light bulbs the target. It’s a simple puzzle mechanic, but has proven addictive if well-implemented. If that was all, the game would likely become boring after a while… but Korean developer AtelierSoft has woven a whole story world into their game and that makes all the difference. Aspiring artist PiPi — who has ‘mother issues,’ as Mother is a famous artist — goes on a journey to find inspiration through exploring colours. On her journey, she meets all kinds of characters who can help her in her search for inspiration. A nice touch: you can befriend nine of them and travel with them. There are over 200 puzzle stages (later ones sound quite complex) and 50 cut scenes promised; I’m not entirely clear whether they’re all in that first chapter! But numbers don’t matter — it’s the inspiration that does, stoopid. Sekai Project's star is rising fast, and the publisher/license of Japanese media and electronic entertainment made a big showing at last weekend's Anime Central in Chicago. The company had several big announcements, the bulk of which contained news about upcoming games. Don't worry, I won't keep you waiting to find out more about the titles: VOID, Re;Lord, and Hoshizora no Memoria. Let's actually begin with that third title, as there is a now a Kickstarter campaign for it that you'll want to get in on! Hoshizora no Memoria is developed by Favorite (its the correct spelling for the company name even though it drives me mad!) and follows Kogasaka You and his little sister, Chinam, who are both reeling from the sudden death of their mother. As a result, they are set to get back to their childhood hometown where an Aunt is waiting to home them. You was very close to a girl prior to his original departure, but while searching for her he instead finds a girl named Mare who — get this — carries a scythe and claims to be a Grim Reaper. Yikes! The game will be released for PC in September 2018 regardless of whether the Kickstarter is a success; the crowdfunding campaign is more about the physical merchandise as the game's already funded for a Western release. VOID is developed by Vivth Floor, creators of Just Deserts, and the game's main illustrator is the same man behind the art for Fate/Grand Order. In it, Arthur is seeking trying to find his girlfriend's murderer; unfortunately, those responsible are the very same that employed him as an assassin in a mysterious organization. Re;Lord is developed by a company that seems to enjoy strange punctuation, Escu:de. It is set in a magical fantasy world where the demon realm is in danger due to three witches of disaster. The territory of Groesen was turned over to the witches due to their overwhelming powers, and within six months half the townspeople has been turned into dolls. The game follows Wilfred, the only person with the ability to defeat the witches. The gameplay involves map-building and clicker-style battles.